Every year, I see everyone talking about the new expert rankings of the "Best Diets" of the year. These are ranked by experts on a number of different factors, but I can never quite understand how very low-fat or low-calorie diets (read: not satisfying + unsustainable) end up in the top 10. We can argue back and forth on the best diet for days, but when it come down to it, people thrive on different ways of eating. I know plenty of people who eat a Paleo style diet that are incredibly healthy, and I know vegetarians or pescatarians who are just as healthy, feel good, and content with their food choices. I also know people who eat a completely whole food diet but are stuck in a diet mindset. Although they may be eating well, their stress levels are through the roof, which impacts their physical, mental, and emotional health. Personally, I've gone through several different styles of eating - restrictive calorie counting, emotional eating, vegetarianism, and an overall whole food lifestyle. Yet, it wasn't until I looked at my mindset around food and started to build self-trust that I found true peace with food. These days, I eat a mainly whole foods diet because that's what I physically crave and feels the best in my body. It's pretty cyclical though - some days, I eat more veggies. Some days, I eat more sugar. I trust myself enough to realize that it's okay to listen to my body and cravings. Honestly, I'm a lot healthier these days (in all ways) than I was when I was eating only 100% "healthy" foods. One, I've found the foods that nourish and energize me with experimentation and tuning into my body. So, what is the Best Diet of YOUR Life? One that energizes and nourishes you. One that doesn't leave you feeling restricted or deprived. One that is balanced based on your individual needs - your activity level, lifestyle, and personal goals. Eating food to fuel, as well as finding pleasure in it. Enjoying food as nourishment, as well as socially. One that is based on your taste preferences, personal and ethical decisions, and allergies or sensitivities. One that helps you tune into your body - your hunger, fullness, and satisfaction. One where you can eat FOOD rather than nutrients or numbers (calories, carbs, fats). It's not very fun if you sit down to a plate of 500 calories rather than savoring a delicious home-cooked meal of food. One where you don't have to stress about eating out, social events, or do excessive planning. Where food is only ONE part of your life - not your whole life. Full of variety throughout the week and year. In the winter, I crave hearty, nourishing, warm foods while in the summer, I eat tons of fresh, raw produce and smoothies. Focused on whole, nutrient-rich foods most of the time. One without guilt or shame based on whatever you eat. 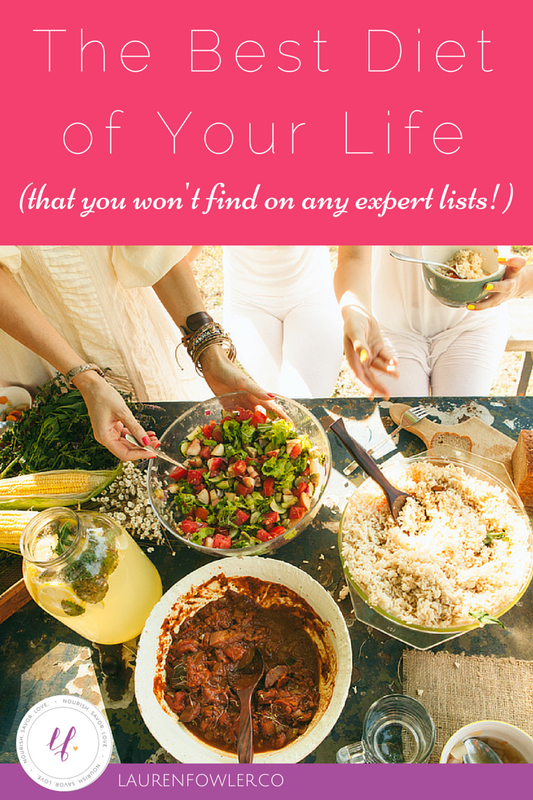 You may have heard this style of eating as Intuitive Eating, Normal Eating, Mindful Eating. Whatever you want to call it is fine - just don't turn these into other diets by feeling bad if you eat when you're full or don't eat sitting down at every meal. It's all about just tuning into your own body, building self-trust, and changing your MINDSET around food. You'll never see these on a list of best diets. Yet, when I see studies that say most diets lead to weight gain in the long-term (not to mention all the stress, shame, and out-of-control feelings), then I say ditch the traditional, restrictive methods of eating. Make a dedication to ditch dieting starting today. When you tune into your own journey of re-building self-trust, breaking down food rules, and starting to listen to your body, you have time. You can't "fail" at this style of eating. All you can do is learn about yourself over time.